Years of efforts to boost the population of endangered fish in the Pacific Northwest appear to be showing signs of success. Through the second week of July, 551,530 adult sockeye salmon passed through Bonneville Dam on the Columbia River in 2014. That surpassed the total of 516,000 set in 2012, and shattered the then-record of 386,525 mark established in 2010. Earlier this year, fish biologists predicted about 347,100 salmon would cross Bonneville Dam. "Anglers, Native American tribes, fishery managers and river users alike are thrilled to see such a huge run," said Terry Flores, executive director of Northwest RiverPartners, an alliance of farmers, ports, business and utilities that includes several electric cooperatives. "It is proof positive that the region's efforts to restore these iconic fish are working." Fishery managers also reported that the adult sockeye run returning to the upper Columbia and Snake rivers hit a high of 34,500 on July 5. 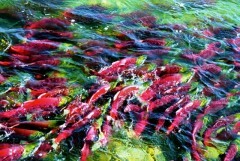 As recently as 1992, only one sockeye returned to the Snake River. On July 11, the count stood at 740 at Lower Granite Dam, more than double the 10-year average. The salmon runs are important to ratepayers, since Bonneville Power Administration ratepayers doled out almost $700 million in fish and wildlife expenditures in 2013. About one-third of BPA's wholesale power costs to customers, including 54 electric cooperatives, are wrapped up in fish and wildlife. State and federal agencies have added new hatcheries, improved habitat and found additional ways for fish to pass safely through and around hydroelectric dams as part of plan now under review in U.S. District Court in Portland, Ore.
Several fishing and conservation groups have asked a federal judge to throw out the fish protection plan. "There is no denying that the region's hard work and massive investment is paying off," said Flores, adding that the challenge can only be explained by the groups' desire to knock down several large federal dams in the Northwest.